This recipe happens to be a lovely mix of my German and redneck ancestries. 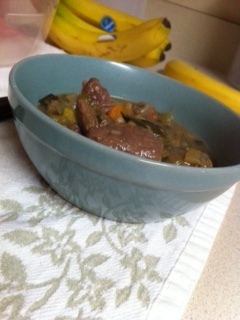 It is a take on a Tyrolean Game Stew, but instead of using a few pounds of liver, gizzards, and meat from any number of varmint I will be using some lean venison stew meat provided by my dad after this year’s hunting season. This recipe has quite a few steps, some of which I don’t understand, but for the sake of following this recipe as best as I can I’ll stifle my complaints and just go with them. Of course, not everyone has access to venison. If your family is lacking someone with a hunting license and the time to sit in a tree stand for hours on end, feel free to use beef. The main differences you’ll notice immediately is how lean and dark the venison is- it’s a beautiful shade of burgundy, almost purple in some cuts. Your mind will instantly tell you, “This is the red meat I should always be putting into my body!” As far as the taste, venison does have a slightly stronger flavor. A good deer that had been foraging on a healthy diet and then properly cleaned and butchered shouldn’t have much of that notorious ‘gamey’ taste. 1. Add your spices (the clove, bay leaf, peppercorns) and veggies (leek, onion, carrot, celery) to the 5 cups of water and white vinegar. Salt the water, like if you were cooking pasta. Bring to a simmer and add the venison. 2. In a separate pot on medium-high heat, add your bacon and fry until the fat has rendered out. If you’re not using bacon, melt down the butter or bacon drippings. Remove the bacon (if you’re using it) and add the flour. This is called a roux, and will give your stew a gravy-like consistency. Take your time with this, and do not walk away! Baby it. Love it. Nurture it. If given time (about 8-10 minutes), it will develop a nutty smell and a deep, rich color. 3. Once you get the roux to the color of cocoa powder, add the sugar. Sugar burns quickly, so let it cook only another minute or two and do not walk away. 4. Whisk in 3 cups of the simmering venison broth, one cup at a time. 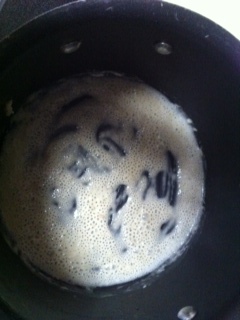 Let it simmer for 10 minutes, and whisk vigorously to make sure the lumps get out. 5. Drain the meat and veggies from the broth. 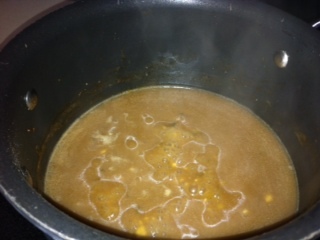 Add the meat and veggies to your gravy along with the red wine, and toss the remaining broth. 6. Let this simmer together for another 20 minutes uncovered.